New Delhi: Scatting attack on Prime Minister Narendra Modi for his comment ‘Congress is only for Muslim men not for women’. Congress on Sunday said that PM Modi is a paddler of untruth and whenever he loses ground, he spread lies and defame the grand old party. “It is a matter of shame when a prime minister of a country speak untruth and mislead the people. He has a history of spreading lies and he had defamed his post on many occasions not only in country but in foreign too. Though, Congress is party of all,” said veteran Congress leader Anil Sharma during a press meet on Sunday at party office in Delhi. During the conference, Congress alleged that whenever BJP leaders found themselves in a hot water they start defaming Congress by spreading lies. “Instead of defaming Congress, PM should chart out about his four years in government. Spreading lies will not work. He should tender an apology for his countless lies, he has spoken since 2014,” Sharma added. 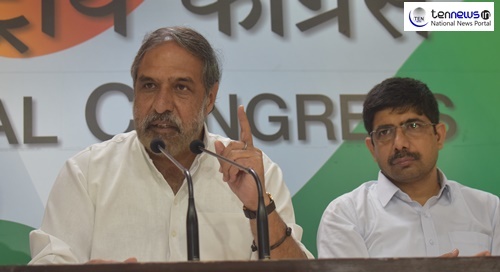 Speaking about Congress plan for the monsoon session of the parliament, Anil Sharma said that all the Opposition parties will meet on Monday to set the agenda for monsoon session. “In the tomorrow meeting, Congress will discuss the plan to corner the government will all opposition parties,” said Anil Sharma. Bikxie Pink Joins Hands with NGO ‘Educational Forum for Women justice and Social Welfare’ to create employment for women!